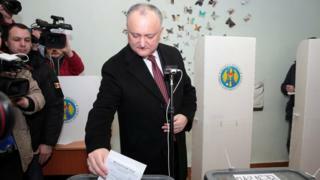 Monitors have condemned what they say are "strong indications of vote-buying" in Moldova's general poll on Sunday. The Organisation for Security and Co-operation in Europe (OSCE) also reported "pressure on public employees" and "misuse of state resources". Moldovan politics include both pro-Russia and pro-EU parties which frequently clash with one another. Both sides accused the ruling Democratic party of electoral fraud - but results showed no clear winner. Moldova, a former Soviet republic, lies between the EU and Ukraine and is one of Europe's poorest countries. Much of the controversy is linked to reports that voters in the breakaway Trans-Dniester region - where there are no polling stations - were bussed to other areas to cast their vote. Parties have accused one another of bribing voters from the region, local media say. With almost all votes counted, the country's electoral committee said the pro-Russia Socialist Party, allied to Moldovan President Igor Dodon, received the most votes at 31%. But the Acum (26%) and Democratic parties (24%), both pro-EU, came in second and third. The parties will now enter negotiations to form a government. Despite its criticisms, the OSCE said the elections had been competitive and that fundamental rights "were generally respected". Yet the elections took place under a controversial new voting system which the OSCE said was created "without inclusive public debate and consultation". Under the new system, the 101 seats in the parliament were split - 50 in a party list system and 51 in single-seat constituencies. The OSCE said the new system caused "difficulties and confusion", but that most aspects of the election were still handled transparently and professionally. But it criticised a campaign in which "control and ownership of the media by political actors limited the range of viewpoints presented to voters". Ahead of the vote, Facebook suspended some 200 accounts it said had obscured their true identity – including some linked to government employees.